When it comes to the Midwest, many people think of our food culture as ranch-obsessed, casserole-eating, and deep fry everything not glued down. The Midwest isn’t typically what comes to mind when you think of fine dining. After all, isn’t it just a flyover zone, anyway? Flyover Restaurant in Columbia, Missouri is proving one day at a time that the Midwest is anything but boring. With a rich history of small game hunting, pork and cattle, the Midwest has a lot to offer the culinary world. Owners and Columbia Locals Adam Wells-Morgan and Dan Dethrow have thrown out the old misconceptions about Midwestern dining and are serving up seasonal small-plates with a distinctive Missouri twist. The small plates are wood fired and made with regional ingredients from local farms. Take a seat at the bar for a drink that’ll knock your socks off. Flyover’s bar highlights Midwest beers, wines and liquors; and a craft cocktails menu truly infused with the taste of home. Since the dawn of time, food has brought people together. When we eat, we take a break from fast-paced life to sit down and really get to know each other. We talk about our day, crack jokes and bond over food and drinks. With this in mind, Flyover’s entire atmosphere is designed to foster connection and community through home-style food and drink. The intimate setting, including family-style small plates and small group seating, invite guests to put their phones away and make new memories. The social aspect of restaurants and bars is what Wells-Morgan and Dethrow value most. They designed the kitchen and wood oven to be as open as the bar so that their guests can visit with the cooks just as much as they do the bartenders and servers. They aim to know all regulars by name, and to cultivate a space that imbues a sense of community. 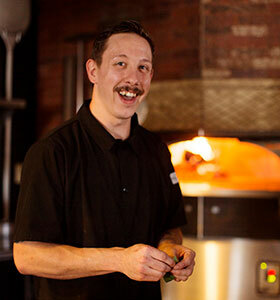 Adam is Co-Owner and Executive Chef at Flyover. Born and raised in Columbia, Adam developed his passion for food in his grandmother’s kitchen at age 10 helping her prepare family dinners. During his senior year at Hickman High School he started his professional culinary career at Columbia’s Trattoria Strada Nova and Cucina Sorella. In the Summer of 2001 he moved to Hyde Park, New York to attend the Culinary Institute of America, where he got a world-class culinary education and completed internships at renowned restaurants such as New York’s Babbo, and Kansas City’s Lidia’s. 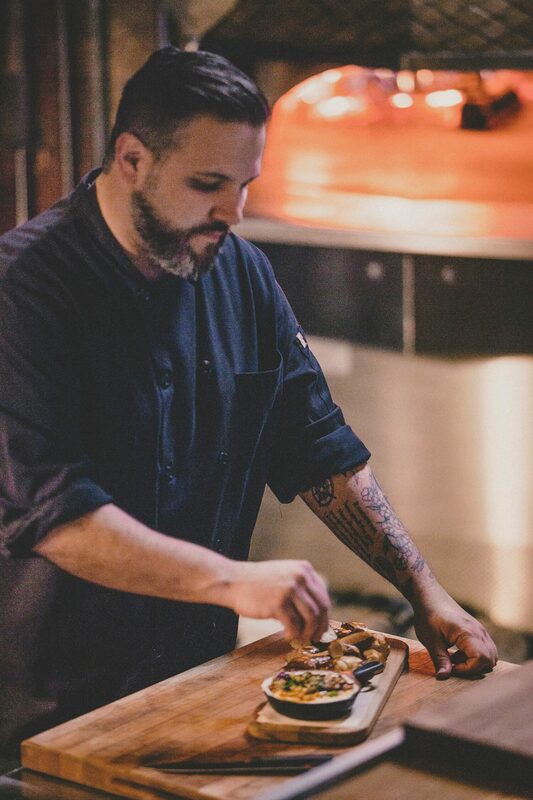 In March of 2003, Adam moved back to Columbia to work as the head chef at Jack’s Gourmet, Village Wine and Cheese, and The Club at Old Hawthorne. In the summer of 2014 Adam and his long-time friend Dan Dethrow began developing the concept for Flyover—which opened July 27th 2016. At Flyover, Chef Adam aims to celebrate regional Midwest ingredients by providing guests with meticulously crafted, yet approachable dishes that focus around their wood burning oven. Dan is Co-Owner and Beverage Director at Flyover, overseeing the bar program. Born and raised in Columbia, Dan grew up in the restaurant industry (his father owned Booche’s from 1976-2005 where Dan worked from age thirteen until graduating from college). He also enjoyed working at Booche’s, Village Wine & Cheese, and Tellers in Columbia. He has since collected over twenty years of restaurant and bar experience living and working in England, New Orleans, Indiana, and Michigan. 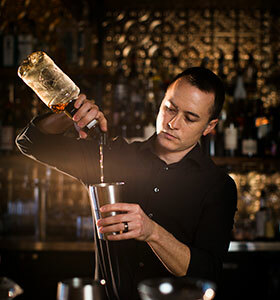 He aims to provide Columbia with sophisticated cocktails served by a friendly staff, and to provide their bartenders with a space to constantly innovate and elevate their craft. Matt is the Sous-Chef at Flyover and one the original employees. A graduate of Rock Bridge, he has worked at Shiloh, Tellers, and Old Hawthorne in Columbia. 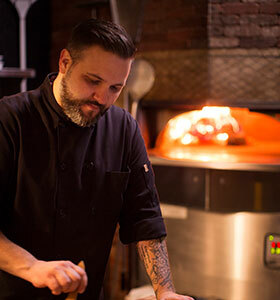 Logging countless hours at the restaurant’s wood-fired oven since they opened, Matt is impressive to observe during service as he shuffles the night’s featured cast-iron dishes and pizza meticulously about the seven-hundred-degree dome. When he is not arriving early to chop wood and feed the fire, or cranking out impressive wood-fired meals, he is in the prep kitchen obsessing over pizza dough. Matt loves pizza. A lot. 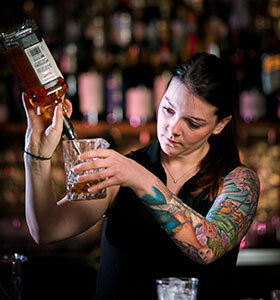 Maddy is a manager and principal bartender at Flyover, and one of the original employees. Originally from St. Louis, Maddy grew up working in her family’s restaurant, Satchmo’s, beginning at age fourteen. She worked at Addisons when she moved to Columbia and began working with the Flyover crew before their grand opening. She loves bartending and learning about new innovations in cocktail culture. She is a regular attendee at the largest cocktail convention in the world, Tales of the Cocktail in New Orleans. When she is not reading a cocktail book or tinkering with bar ingredients, she is probably obsessing over her cats…or videos of cats. She loves cats. A lot.